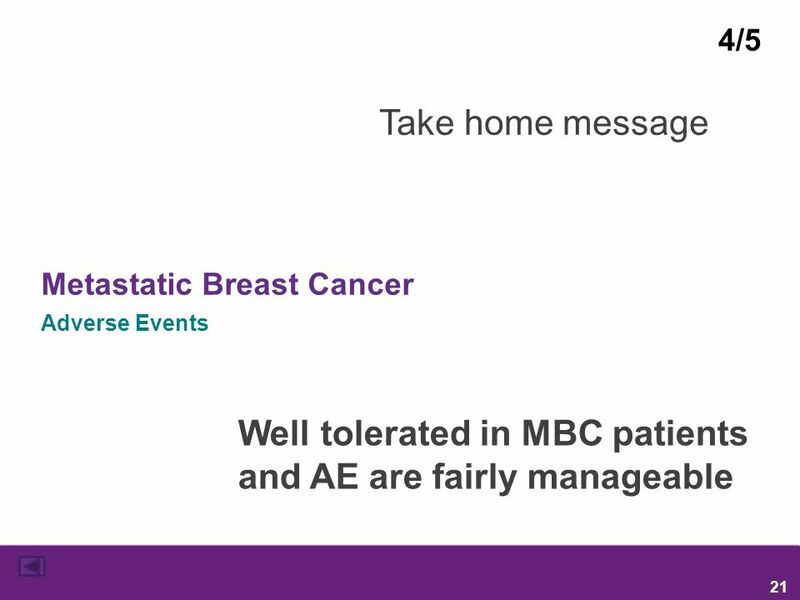 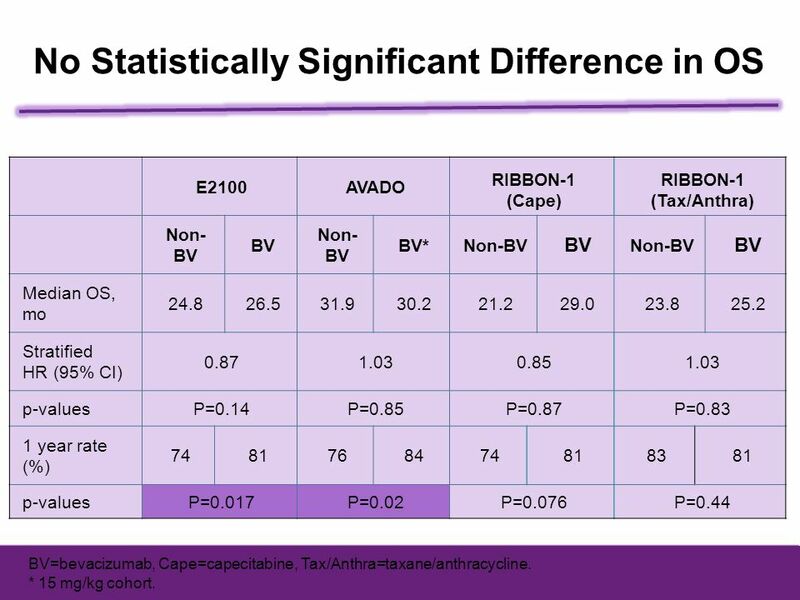 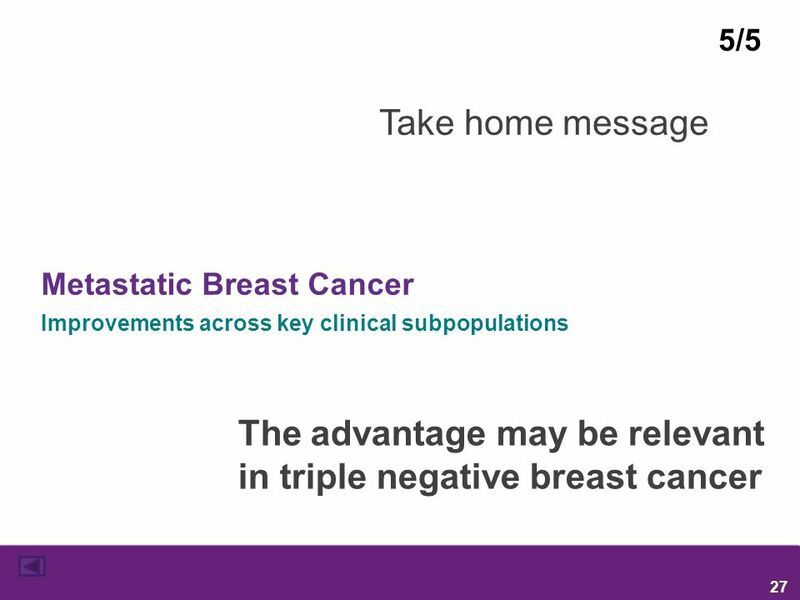 Take home message Breast Cancer Bevacizumab in MBC Sabino De Placido 1. 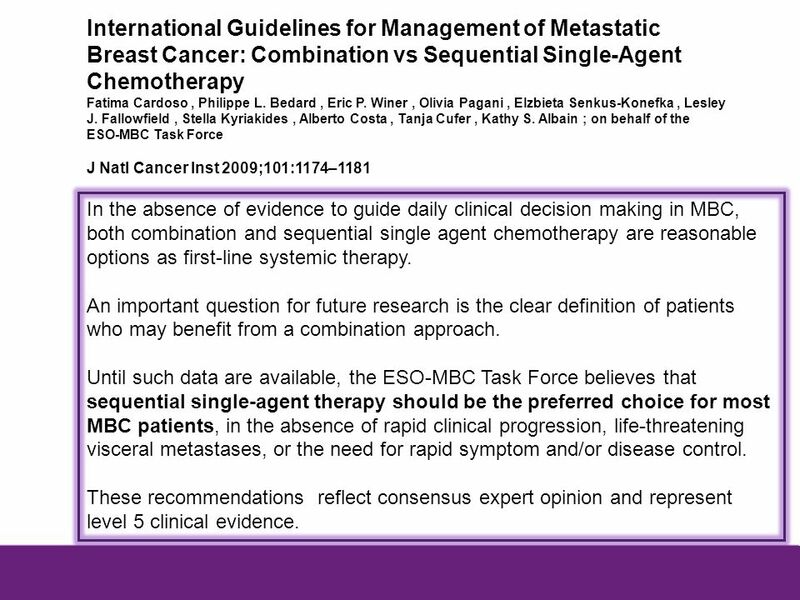 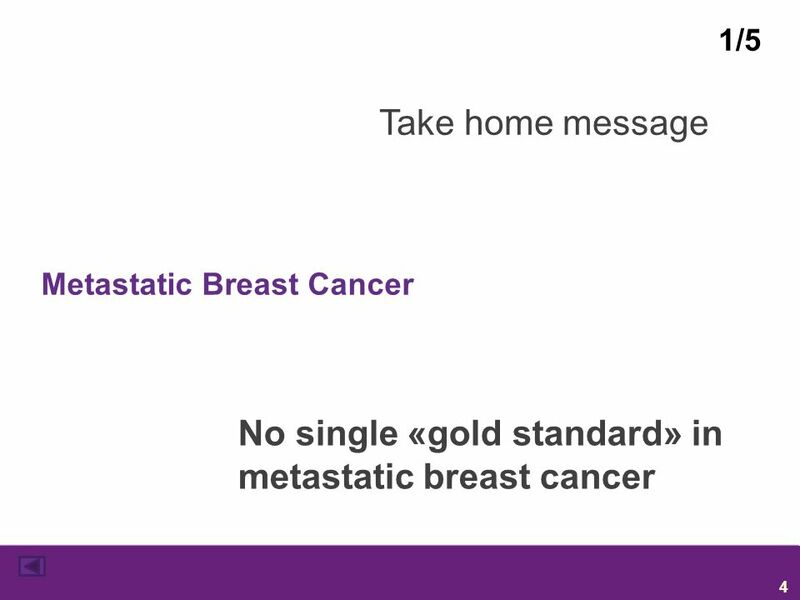 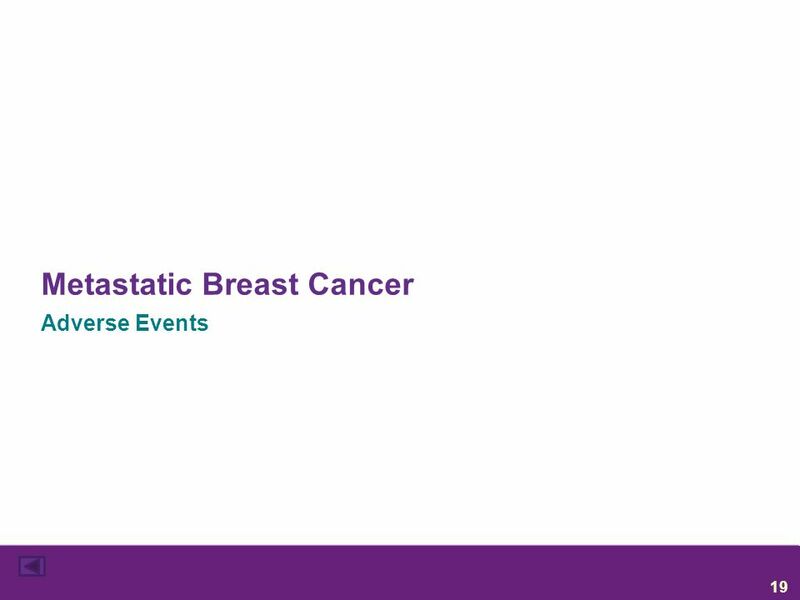 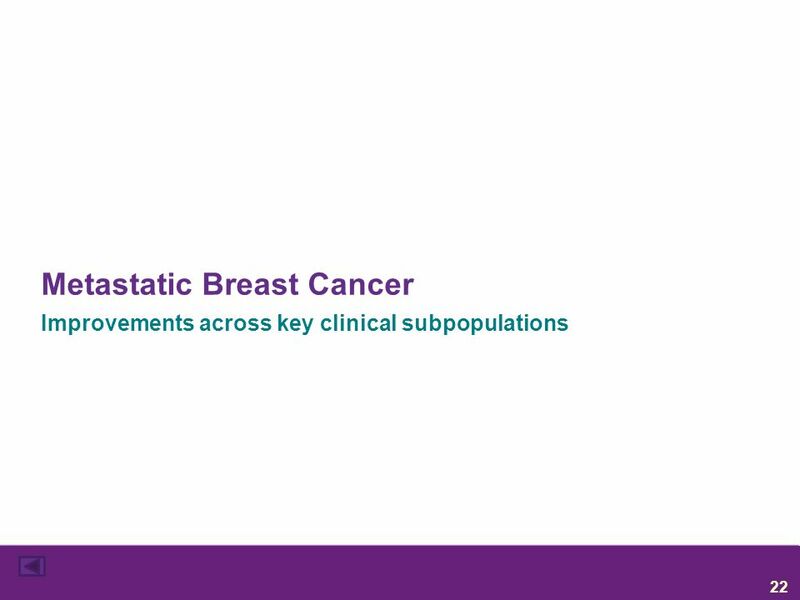 3 International Guidelines for Management of Metastatic Breast Cancer: Combination vs Sequential Single-Agent Chemotherapy Fatima Cardoso , Philippe L. Bedard , Eric P. Winer , Olivia Pagani , Elzbieta Senkus-Konefka , Lesley J. Fallowfield , Stella Kyriakides , Alberto Costa , Tanja Cufer , Kathy S. Albain ; on behalf of the ESO-MBC Task Force J Natl Cancer Inst 2009;101:1174–1181 In the absence of evidence to guide daily clinical decision making in MBC, both combination and sequential single agent chemotherapy are reasonable options as first-line systemic therapy. 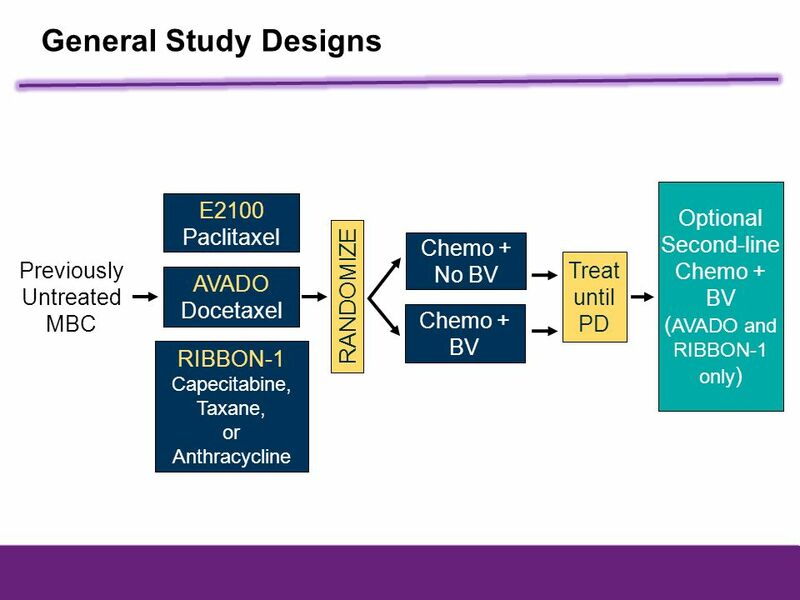 An important question for future research is the clear definition of patients who may benefit from a combination approach. 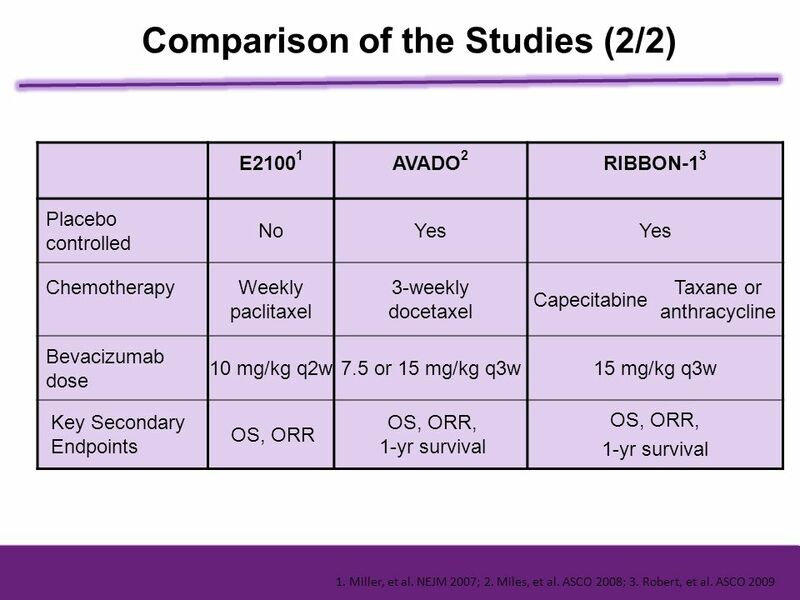 Until such data are available, the ESO-MBC Task Force believes that sequential single-agent therapy should be the preferred choice for most MBC patients, in the absence of rapid clinical progression, life-threatening visceral metastases, or the need for rapid symptom and/or disease control. 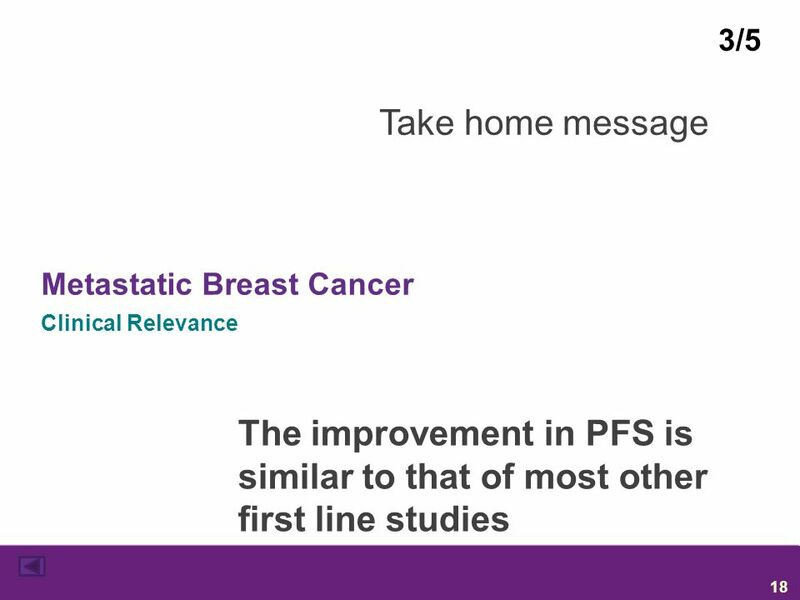 These recommendations reflect consensus expert opinion and represent level 5 clinical evidence. 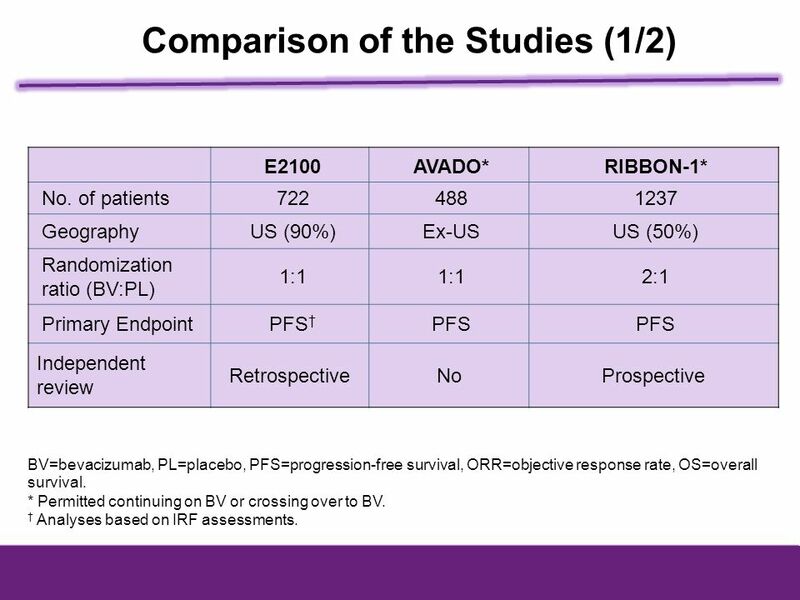 AVADO* RIBBON-1* No. 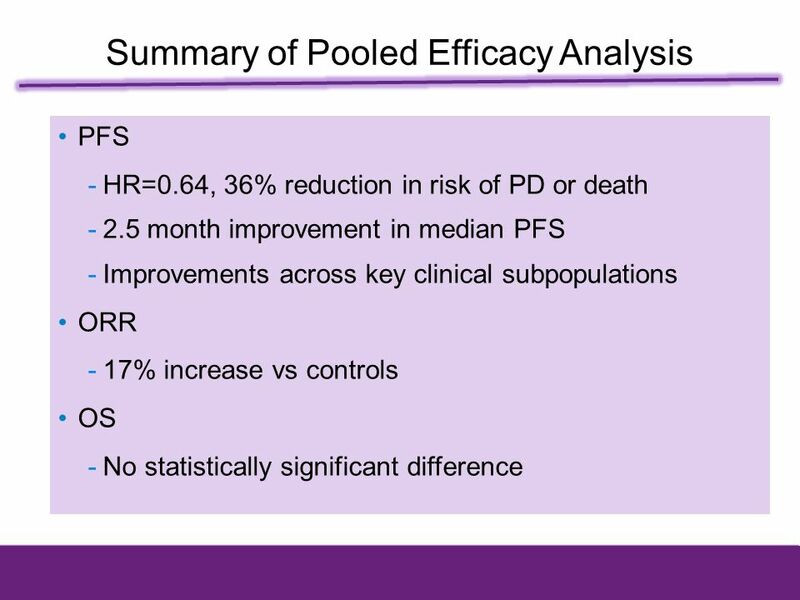 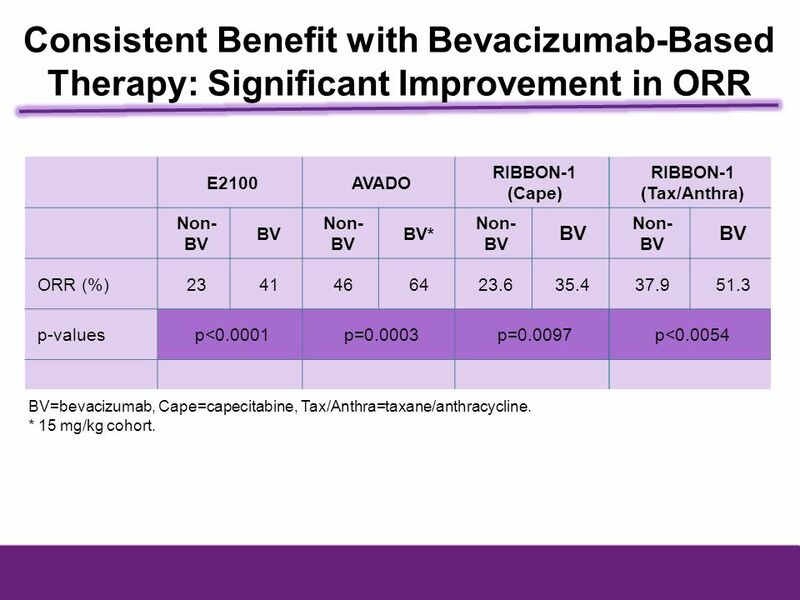 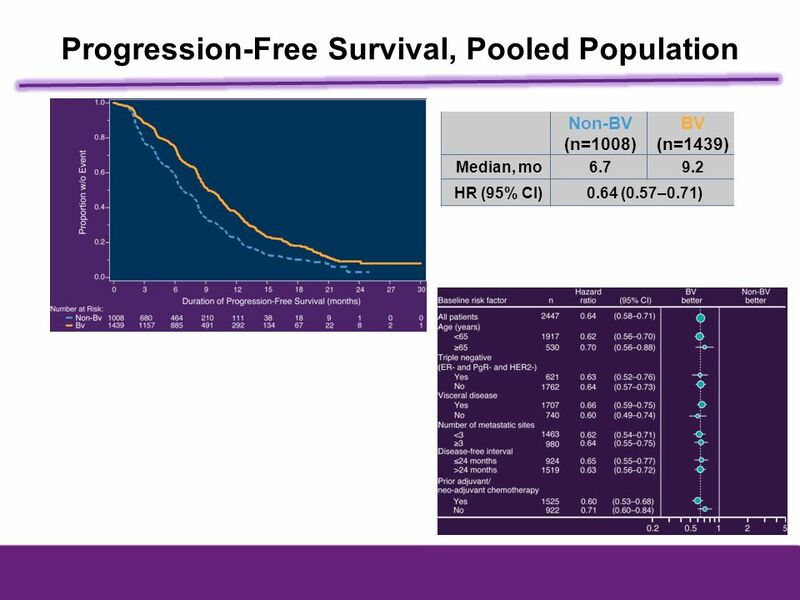 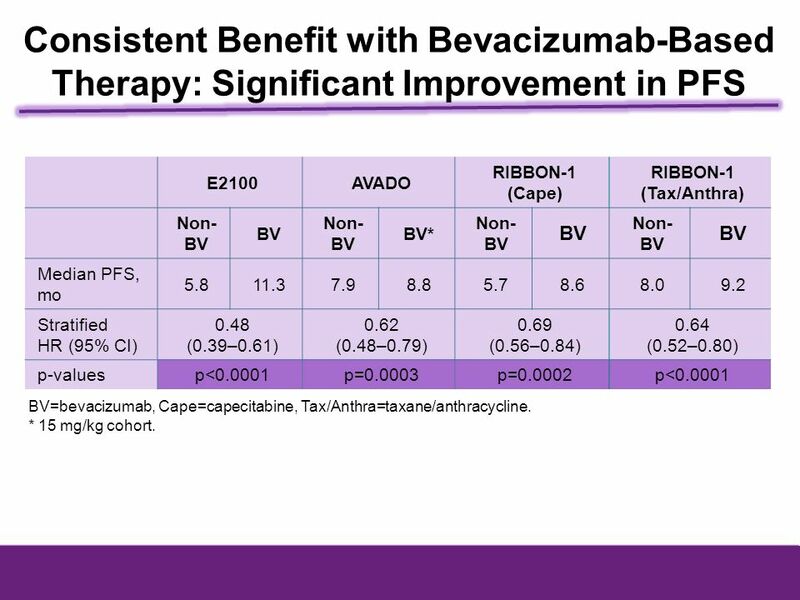 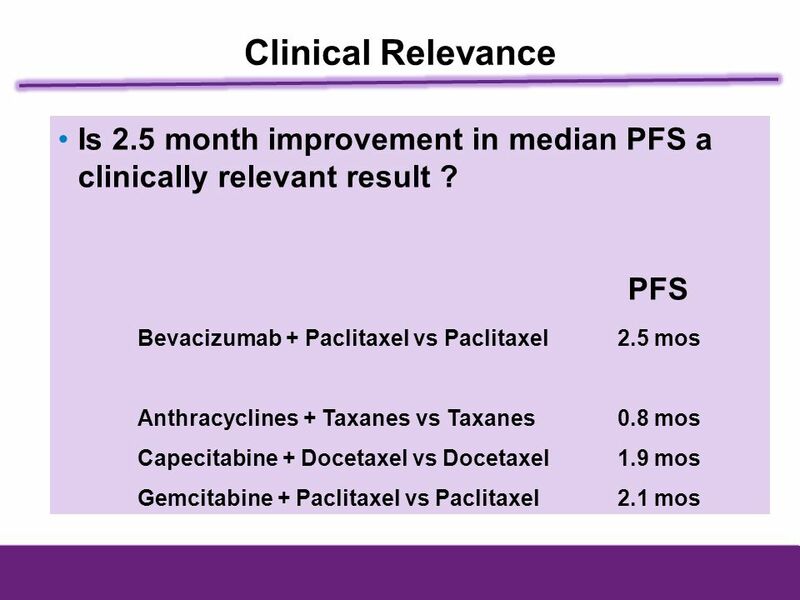 of patients 722 488 1237 Geography US (90%) Ex-US US (50%) Randomization ratio (BV:PL) 1:1 2:1 Primary Endpoint PFS† PFS Independent review Retrospective No Prospective BV=bevacizumab, PL=placebo, PFS=progression-free survival, ORR=objective response rate, OS=overall survival. 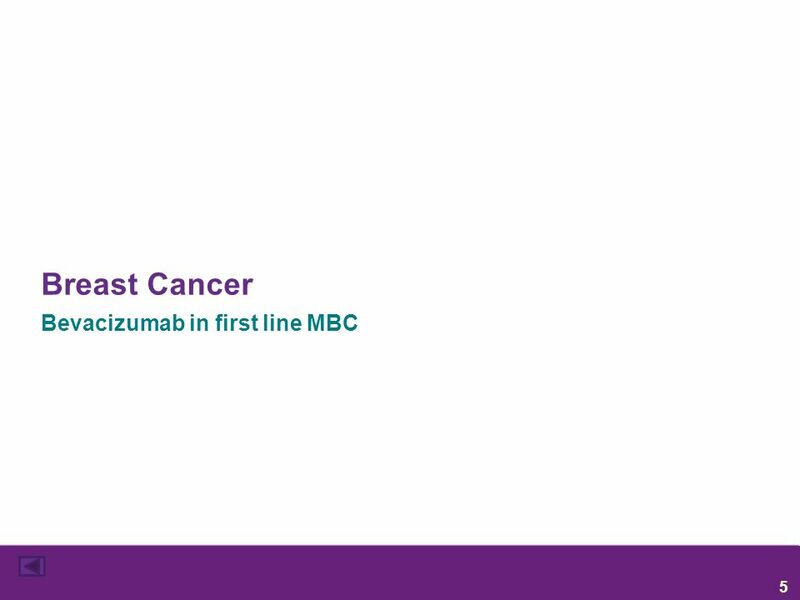 * Permitted continuing on BV or crossing over to BV. 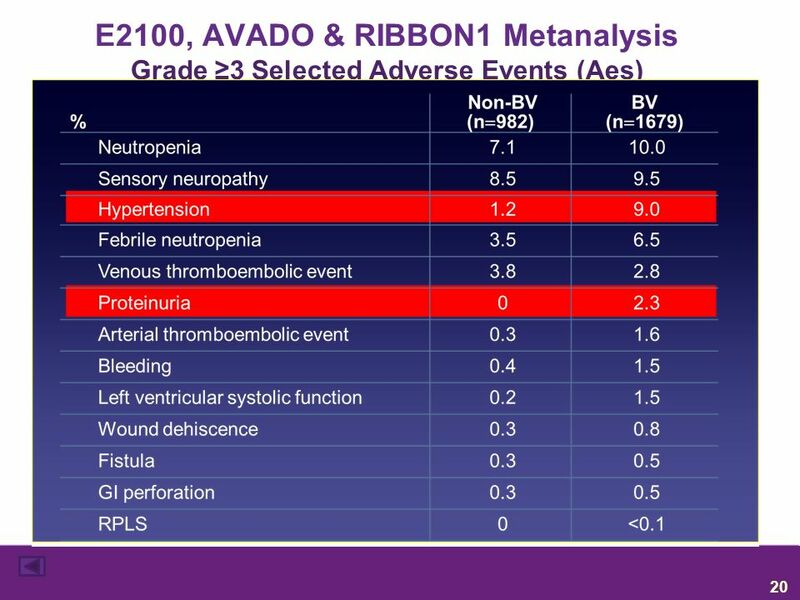 † Analyses based on IRF assessments. 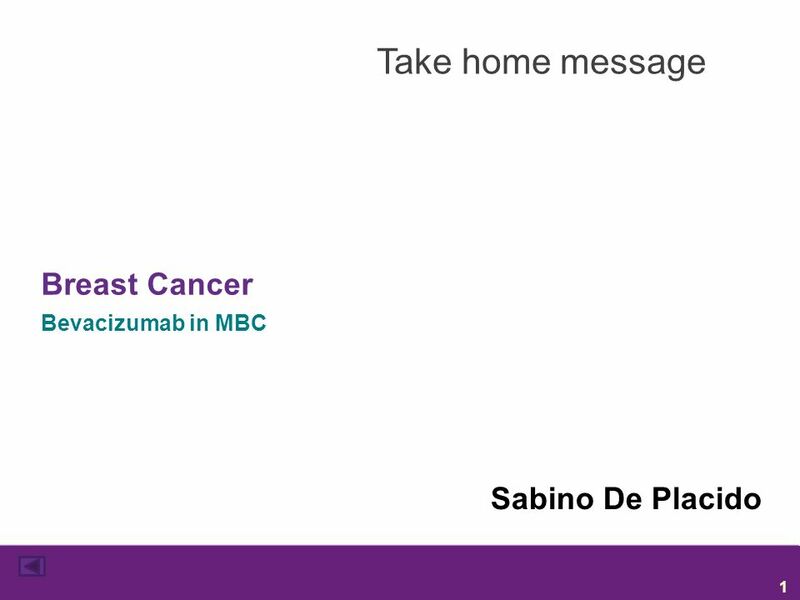 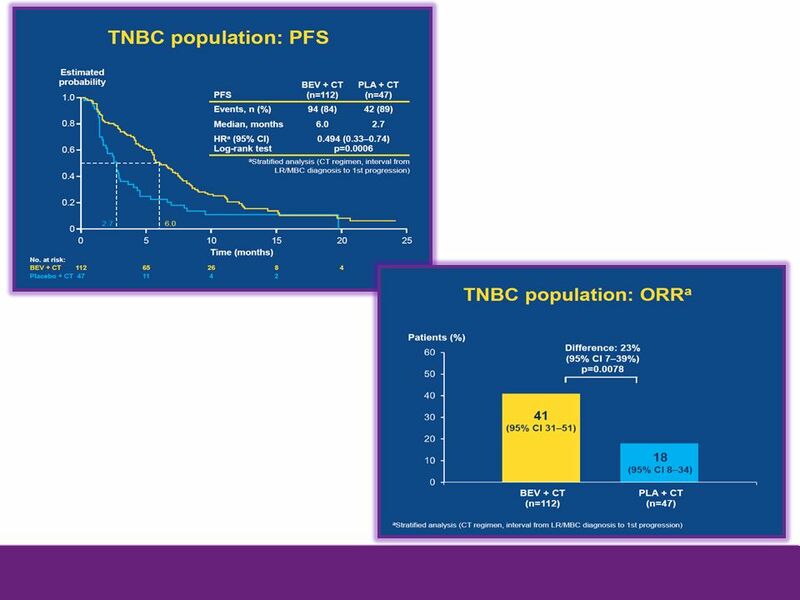 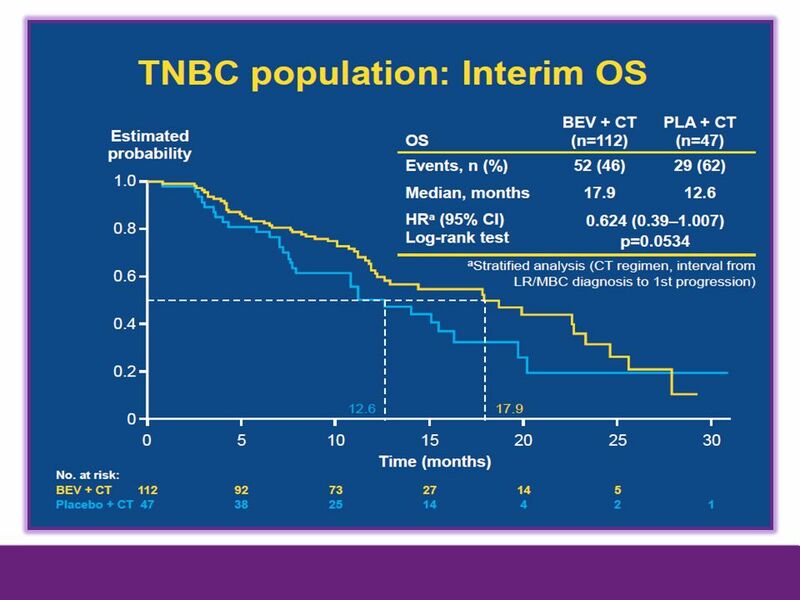 Download ppt "Take home message Breast Cancer Bevacizumab in MBC Sabino De Placido 1." 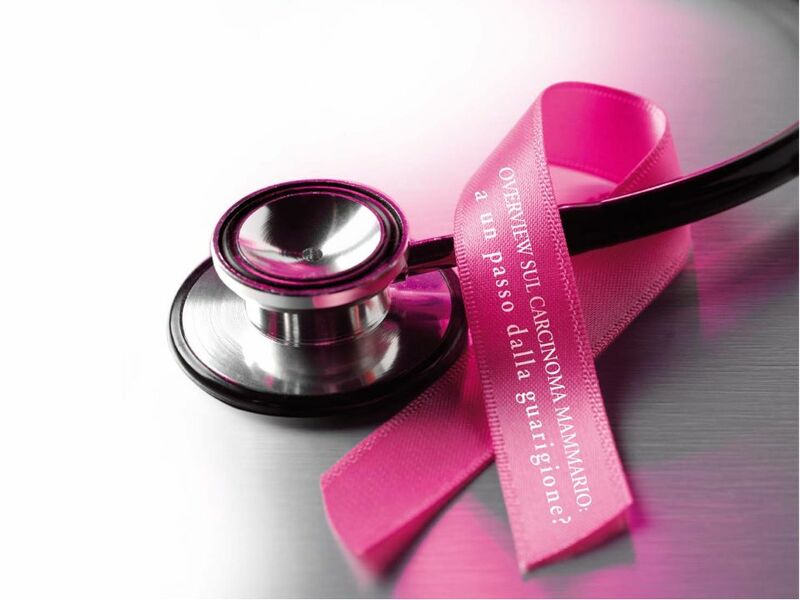 NDA TLC D-99 Doxorubicin HCL Liposome The Liposome Company, Inc. 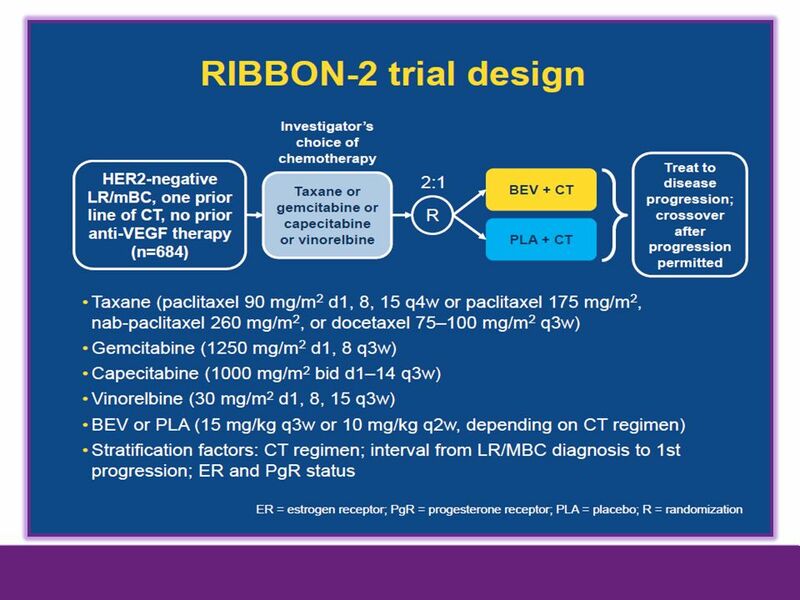 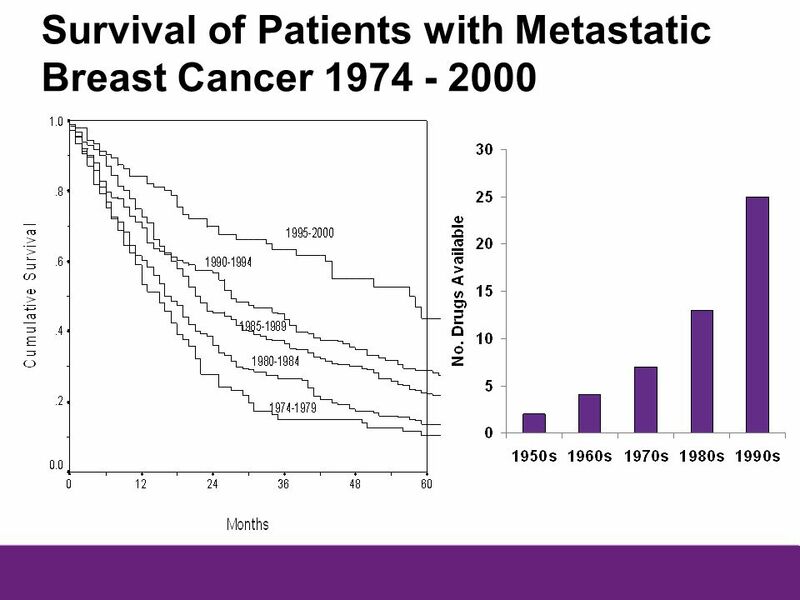 Proposed Indication: “First line treatment of metastatic breast cancer in combination. 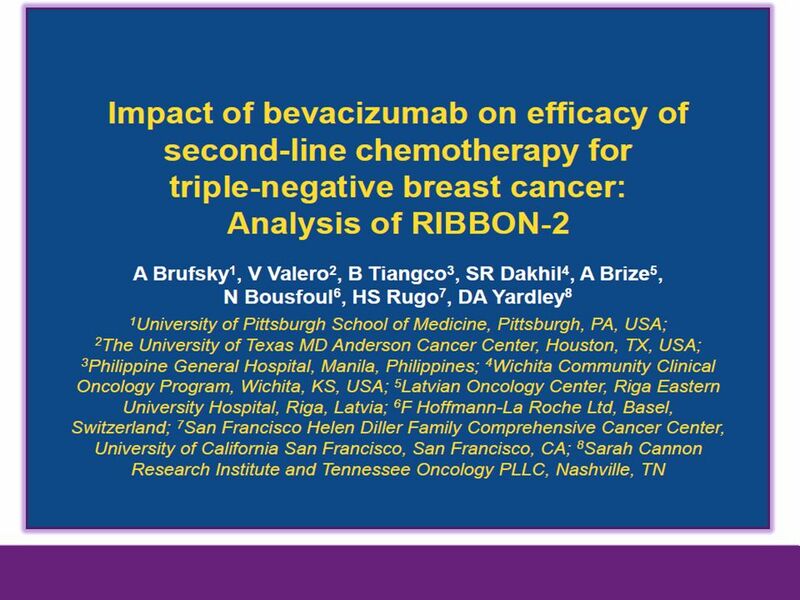 Bevacizumab taxan Första linjens behandling vid metastaserande Her2- bröstcancer. 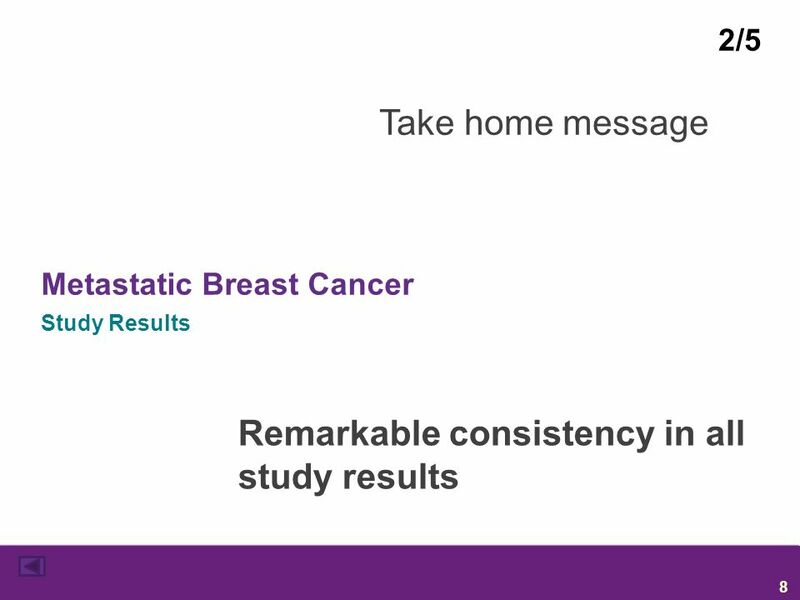 Discordance in Hormone Receptor and HER2 Status in Breast Cancer during Tumor Progression Lindstrom LS et al. 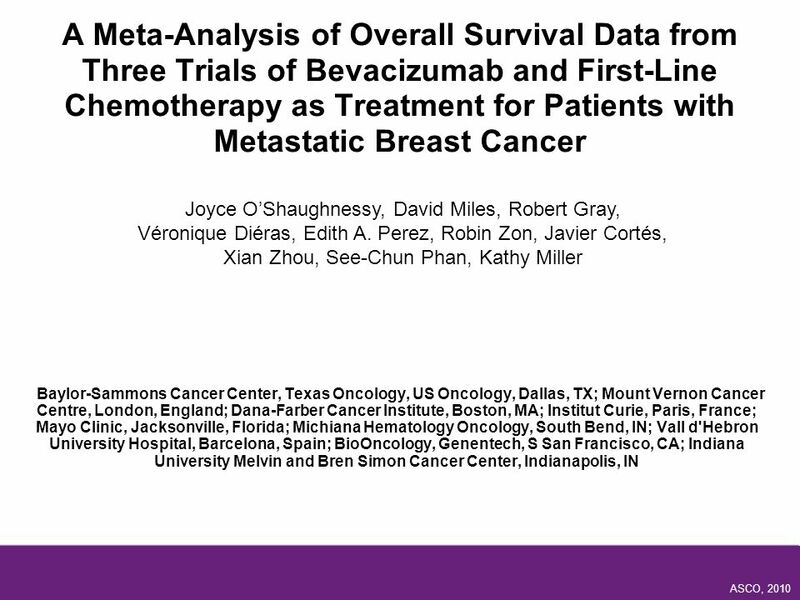 Proc SABCS 2010;Abstract S3-5.